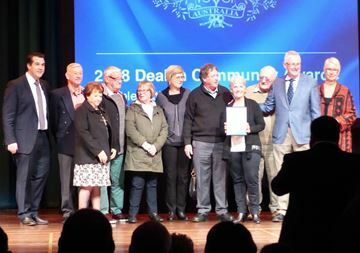 Our Club has been formally recognised for our outstanding contribution to the local community. 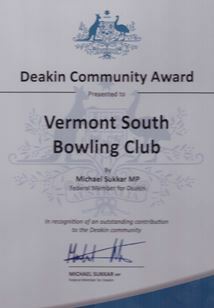 Federal MP Michael Sukkar presented the Deakin Community Award to us for our efforts in organising and running a weekly bowls program for disabled members of the community. We have been doing this for several years and it has been a rewarding exercise for all involved. We have a team of people, led by Bernadette Ross, who run the sessions and many were present at the award night. See photo below. Pictured L-R: Michael Sukkar MP, Geoff Parry, Denise Parry, David Russell, Pat Russell, Trish Martin, Ian Bennett, Mary Farley, David Perry, Michael Keel (Bowls Club President) and Bernadette Ross. No Replies to "Community Award for our Club"